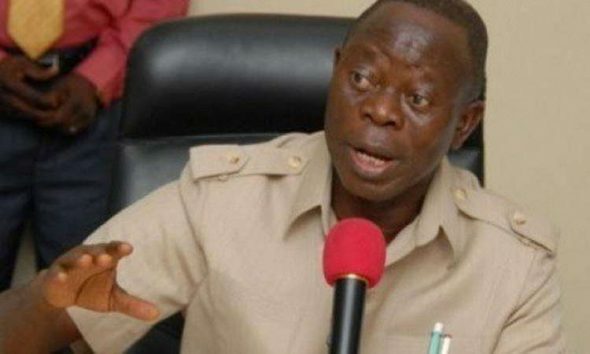 The national chairman of the All Progressives Congress (APC), Comrade Adams Oshiomhole, has taken a swipe at a chieftain of the party in Abia, Chief Ikechi Emenike, over his alleged romance with the Peoples Democratic Party-led administration. Oshiomhole claimed that Emenike was being sponsored by Governor Okezie Ikpeazu and the PDP to cause confusion in the party, thereby weakening the chances of APC in the forthcoming 2019 general elections in the state. Emenike had on several occasions claimed to be the authentic gubernatorial candidate of APC in Abia, which the national leadership of the party frowned at. The APC national chairman, who made this known, in his speech during the flag-off of the Abia APC Governorship Campaign held in Umuahia, the state capital, vowed to resist what it termed as evil machination of Emenike to sabotage the party leadership ahead of the March governorship election in the state. According to the former Edo state governor, â€œIkechi Emenike is APC in the day and PDP at night. He betrayed me in the secret and I will betray him in public. You canâ€™t be holding broom in the day and be visiting the PDP governor at night collecting money from Ikpeazu to make sure you keep APC busy in court. â€œI am Adams Oshomhole, I will make sure Emenike did not see the light of the day in politics. No reasonable APC member will complain the type of primaries we conducted in Abia state. â€œWe conducted direct primaries, which Dr Uche Ogah won. And I assure all of you Uche Ogah is the next governor of Abia stateâ€. Meanwhile, the Abia state chapter of the All Progressives Congress(APC), has restated that the suspension of Chief Ikechi Emenike, from the party, still stands. The publicity secretary of APC in the state, Comrade Benedict Godson, who made this known in an interview with newsmen on Monday, frowned at the anti-party activities of the party chieftain (Emenike). But the media Aide to Ikechi Emenike, Mr. Mike Ozoemena, in a chat with newsmen in Umuahia, dismissed the purported suspension. He said, â€œMy principal remains a high ranking member of APC both in Abia state and Nigeria as a whole. â€œHe has never, and will never engage in any activity that may mar the chances of APC in the upcoming governorship election in the state.